This is the first Malfrid Gausel Pattern that I made for Mia, the Summer Jacket. It fits her beautifully! She wears it with many different things, and she is waiting for me to finish the matching dress too. I knitted it in a 4 ply cotton and am very pleased with it. Comments for Mia loves her Summer Jacket! This is a very nice jacket. It turned out so beautifully!!! So nice! I like to see the jacket used to other doll clotes! Mia looks wonderful in her summer sweater! The sweater looks great in the 4-ply cotton--I won't be worried about trying cotton with some of the patterns now. Thank you! I love Mia's jacket. I'm anxiously awaiting the delivery on new yarn to start this exact Malfrid design. Great job. 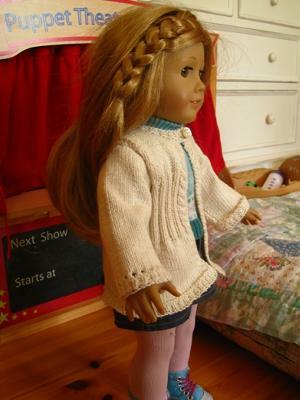 I love how great your doll looks in her jacket. Nice work!